Psypoke - View topic - Werewolf XXI - Drunks Only Live Once - Town Wins! Werewolf XXI - Drunks Only Live Once - Town Wins! Thundawave will (most likely) be replacing filter, as soon as she gets back to me. I am the reason Cherrygrove is shivering. He is slowly freezing to death. Today is his last day alive. "Well why would you pick him? Why not twistedturtwig, who has been suspicious all game long?" Because it takes three days to work, and my decision had been made before the whole drama with twistedturtwig came into light. You see, since this is my first game here, I asked DNA who the good players were before the game started. I took the five or six people he mentioned, threw them into random.org, and Cherrygrove was picked. I targeted him on night zero (one). Is he scum? I dunno. Guess we'll find out, lol. What's that? Why not wait and see if any scummy people turn up? Because the ability takes three days to work. I wanted to get results as fast as I could. I don't like all of these town-aligned anti-town roles. All it does is make the scum's job easier. Had SS been protected, we would have lost our doctor for the rest of the game just for doing his job. The number of town vs number of scum just means there's a greater chance for us to be harmed than them. The only thing we gained from SS's death is that one of the wolves just turned vanilla. Click the dancing Mawile to visit her home. I think I might have just facepalmed straight through the computer. Two townies dead, just like that. Learn to rude the rules, please. Revealing a role, fake or not, goes against the very core priniciples of Werewolf. The thing is, you're supposed to not know who is who, making anyone a suspect (unless you're the Seer, of course). If that just cost us the game, I'll be ticked. And as for my vote, I too will vote for mudkip mistriss. I voted for her yesterday, and I'll stick with it. I had the theory about her trying to kill all the old wolves, and would you look who dies next? Just as I predicted. The evidence is just too clear not to follow it. What's wrong with the way I play? Anyway, it does look like I'm but I'm not. I have no way of proving this statement but it is true. But seriously I can't prove my innocence until someone tells me what's wrong with the way I play? Last edited by GhostPony750 on Mon Jun 17, 2013 3:00 pm, edited 1 time in total. At this point, I wouldn't follow a bandwagon made by PMJ... After what happened with Drago_Girl. So, up to this point, DNA has to been putting flavour text into the logs except for the 'Today is not interesting' or 'Today had shenanigans'. Who has a steeled toe boot? Chill. Although, there are two steel types, Steelix doesn't have a boot. Oh wait, there are Alpha wolves in this game... With four to five wolves, and three nights passed, Chill probably hasn't been the Alpha yet. This is why I hate where this game is going right now. As to whether or not it cost the townies the game? I have no idea, but if I had to guess, the answer is probably yes. It has not been started by PMJ, so don't worry. Even if I were the one to start the wagon on mudkip mistriss, can you really fault me for Drago_girl? It's not like everyone who ever led a wagon was right 100% of the time, and for Day 2 the logic was sound enough. Actually, I'm pretty sure that no pokemon were boots. Anyway, I don't think the whole "steel-toe boot" means that a steel type is a wolf considering there are only two steel types playing and if one of them were a wolf it would give them away as a wolf. The steel toe boot thing is probably just because it sounds cool. 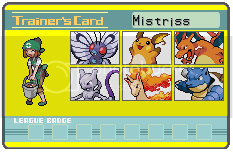 Anyway, the fact that there have been three people that have been killed buy the wolves so far and all three of them were wolves in the last game and mudkip mistriss was the first one to die last game makes her a big suspect. This is a good example of why it's a bad idea to have so many killing roles in the hands of the town. They backfire a lot more often they succeed, and all it does is cast doubt over everyone and make it that much harder to scumhunt. Make me aware you're actually reading the damn thread. And hope that Thundawave doesn't get back to me before the game is over. I actually think it's a good idea. It's more fun, and we need to think before using our abilities. You're all making a big mistake. The werewolves are framing me, something that happens a lot in werewolf. Though I can't prove this statement , it is true. I find Twist suspicious he really wants me dead, this vote is not about revenge, and as a strong player he hasn't been killed yet. I think mudkip is right, tt was the one that was first framing mudkip. Wolves are smart maybe he was trying to frame mudkip mistriss from the beginning by killing all the wolves from the last game. Also, I think one of the ice types is a wolf, however I don't think Ghostpony is one of them since he has been unable to do anything for the last two rounds. That leaves PMJ and James. PMJ has admitted to making Cherrygrove sick, but I don't think that rules him out as a wolf. James admitted to freezing Chill, however he said he tried to do it last round and it didn't work so why would he try again? Also, we still don't know who froze Dare or for what reason. I don't think its James since he said that he froze Chill. I think both PMJ and James are suspicious, but won't vote for either of them yet. If I was going to spend all that time framing someone and using three night kills to do so, I wouldn't do so on a newer player with little experience playing Werewolf, instead I would do it on a veteran with a lot of games behind them. Who knows; one of the wolves could be framing me by framing mudkip mistriss because they know of my suspicions of her, so that if she is lynched and revealed to be an innocent, the suspicion will be turned on me. See, my theory as to why I haven't been eaten yet is that the wolves know that they don't need to waste a night kill on me when they can let me be lynched by turning the town on me because of the sheer amount of suspicion I arouse that way. They're trying to get the village to cave in on itself and turn on each other until no one is left. We just have to do our best not to let that happen. Dare was frozen because DNA read his notes wrong. To make everything in order, Chill was frozen this round and the next round. So, Id like to know, where did all the hype of "One for eh ice types must be a wolf". At a glance, PMJ has a powerful ability of killing a guy in three rounds. I can freeze things for two rounds. Ghost, hasn't done anything at all... Involving abilities, that is. If the above statement is true, Ghost would be the most likely of the three of us. Mudkip, Wailord and GhostPony: Wailord is trying to protect both Mudkip and Ghost with no real reason. He explains that Mudkip might be framing, after 'Kip says it. Then, goes on to explain that Ghost must be safe because of the lemonade and Jack Daniels... How does items that prohibit you from talking and voting in the game, prevent you from talking to the other wolves? A wolf must always try to look like they're playing the game and helping the town, without actually adding anything new. They must always reword what someone else has said and make it seem new. He must at all costs, do this. Then, goes on to explain that Ghost must be safe because of the lemonade and Jack Daniels... How does items that prohibit you from talking and voting in the game, prevent you from talking to the other wolves? -I can still talk with these items, but my votes doesn't count, like if I'm drunk, and I can't use my abilities at all. -I have a relationship with mudkip when I'm trying to kill him/her. And I couldn't do anything for the first 2 days and nights. You know how most people right now think that one of the ice types is a wolf? Looking back at the previous rounds I noticed something. For every previous round and this one too, PMJ and twist have voted for the same person. I already have some suspicion towards twist and the fact PMJ is voting the same as him and is an ice type makes it seem like he's a wolf. Also, he admitted to making Cherrygrove sick. He said his reasoning was he was told he was a good player, but why would you want to kill a good player, with no suspicion of him being a wolf? Unless of course you, yourself were a wolf? I'm not going to un-vote twist yet, but keep in mind PMJ might be a wolf after all. Unvoting is allowed, yes, but if you unvote as often as you blink then I'll be restricting it. Well since it looks like I'm going to die, I might as well use my magical voting powers. I've had a hunch about him from early on, similar to how I had a hunch about ChillBill in WW19. It's a bit awkward voting for him now since he made me sick but oh well. Also, I'm going to officially vote for PMJ, because I'm pretty sure he is a wolf now.